Luncheon with two friends at Otto’s last Wednesday had been in the diary a little while and was certainly something I was looking forward to. When you are having potentially stunning bottles it is also a little nerve wracking. Fortunately everything showed very well so the nerves were not necessary. We started with Champagne Salon 1999 Le Mesnil, served in white wine glasses rather than flutes, serious Champagne should not be too constrained. This was showing really well if oviously very young. It is always a tight and mineral wine but especially so with the 1999. The texture was special. For the Salon devotees out there, and that tends to be most people who have discovered the house, I would say the 1995 and 1997 will offer great drinking while you way for the 1996 and 1999. Anyhow there is a full Salon post coming up soon so more detail there, this showed well. The Grand Cru chablis of Champagnes when young I often think. From here we moved to two white Bordeaux. This was fascinating, firstly because I like white Bordeaux but secondly because the age and prestige of the two wines was very different. We had the wines side by side but up first was Malartic-Lagraviere Blanc 2005 (Grand Cru Classe de Graves), which is 90% Sauvignon and 10% Semillon. It was in a lovely place, mellowed a bit but still with good acidity starting to get a little richer. Well and truly into the middle stage of development which is as it should be. It had a good long finish. Ripe but not over the top, impressive. 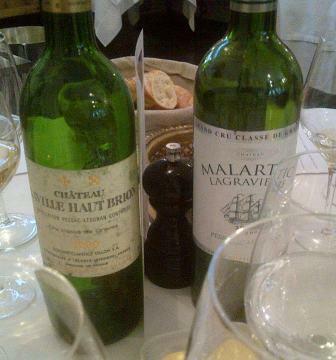 The second of the whites was Laville Haut Brion Blanc 1990 (Pessac-Leognan), now called La Mission Haut Brion Blanc. This is the second time I have had this vintage of this wine. It was a little closed on the first pour but did nothing but open out over the next three hours. Both these whites were good with cheese later on. The Laville had the nose of exotic fruit but as with the Malartic it stopped short of being over done. You would have fun with people blind tasting this as the nose suggests sweetness and this is the core point really. I can’t remember having a white wine with so much intensity on the nose and a lovely balance of fruit, lanolin and unctuous on the palate but being dry, proper stuff and whilst I wouldn’t dream of defending the current release prices of the very few ultra top white Bordeaux I feel their prestigious position is justified and ignored by too many people. With a cracking mushroom starter and a very generous pre-starter of scallops it was time to accompany my pig’s trotter with some red and not just any reds…Mouton Rothschild 1989 was first. 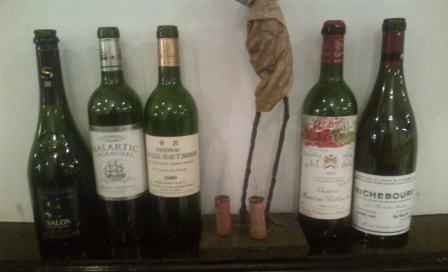 To sound completely pompous and I slightly cringe as I write this, the Mouton 1989 was a perfect lunchtime Mouton. My friends agreed and to explain what I mean; it had an exotic and typical Mouton nose, quite high toned, volume turned up, on the plate it had a good hit of initial black red fruit it was not though, profound and was a little light in the middle palate. perfect now, in fact I would say it is one to hedonistically just tuck into now and over the next 3-5 years. I can’t see another level of development so drinking it while the nose it stunning and fruit is still there makes sense. 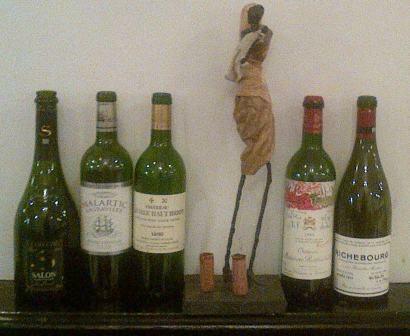 The lunch had initially been planned around the next bottle Richebourg Grand Cru 1991, Domaine de la Romanee Conti. It did not disappoint. The wine worked immediately it came into the glass but it also grew in stature and expanded over the next 90 minutes. Delicious red black and slightly bruised fruit but also a savoury edge just arriving, 21 years of age in great for grand cru in my eyes and mind. A wonderfully uncompromising edge about it, “rustic” is too often a negative term but in the world of Grand Crus were a few are a little too polished this had a dash of rustic grace about it. 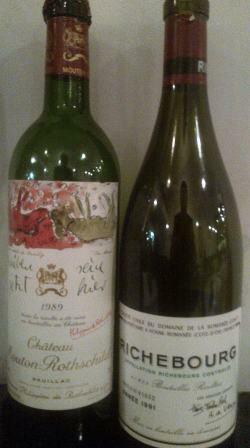 The depth and structure were very much Richebourg. A delicious bottle of wine, still developing and still evolving but if you have more than one bottle definitely a good time to try it…it will not disappoint. Sharing great bottles with like minded people who just want to enjoy what the best has to offer is one of, probably “the”, very best part of the wine trade. This was a cracking lunch, everything worked from the food to the service and most of all the wines and the people! Next Next post: Birthday bottles….